The jungle is in disarray as the animals have lost their partners! Only the colorful magic bird soaring high over the treetops has a good overview. His magic feathers float down gently helping to bring the animals together again. 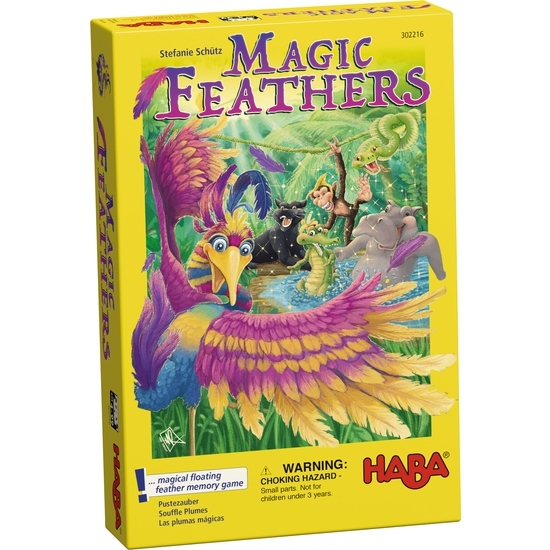 Who will help the magic bird find the matching pairs by blowing his feathers onto the animals? See who, with a bit of skill and luck, collects the most animal pairs. Contents: 1 magic bird, 5 floating feathers and 5 replacement feathers, 40 animal tiles, 1 set of instructions.